“Juley” is a Ladakhi greeting, and here I am sitting in leh, with a view of Namgyal Tsemo Gopal & the Palace, and I’m as happy as happy can be. Here you go. My view. Right now. The Gompa is the white structure & Leh Palace is the brown one, lower down the mountain side. 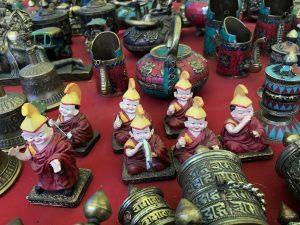 I first visited Leh in 1984, and this is my 8th? 9th? visit to a part of India that I absolutely adore. But as this afternoon’s stroll through town reminded me, Leh is changing. Obviously it’s changing, as more and more tourists visit, and connectivity improves, and so on and so forth. 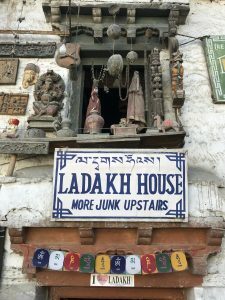 In my early visits to Ladakh, there were very few domestic tourists, whereas now the town is packed with Indian visitors and the menus offer North Indian food galore. I flew in yesterday, on a jam-packed flight, & although I didn’t do a headcount, there were just 3 obvious looking Ladakhis on the flight, probably about 5 foreigners, and the rest of the plane was full of domestic travellers – and not the hiking & tekking variety, but big family groups, many of them with teeny children in tow. Leh is most definitely on the tourist map. I was last here in January 2016, for the Chadar Trek, and though many of the shops were closed then (tourism drops off hugely in the bitterly cold winters) today still came as a bit of a shock. 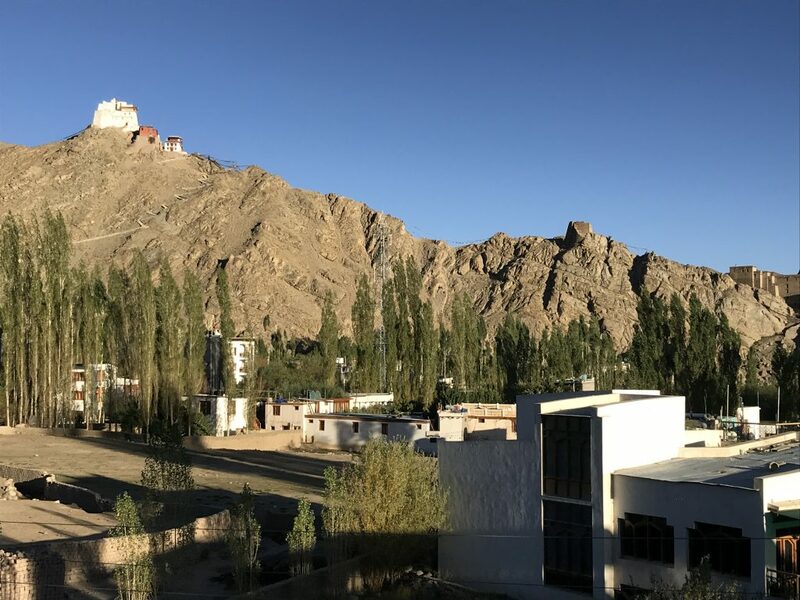 New hotels at every turn, more coffee shops than you could shake a stick at, and the main street has been paved & “beautified”, and a new mosque is being built…and yet there is still enough of the old Leh here, that it is a real pleasure to be back. I’m being politically incorrect, I know, but if another Kashmiri tries to sell me a “pashmina”, I might just scream. Or worse. 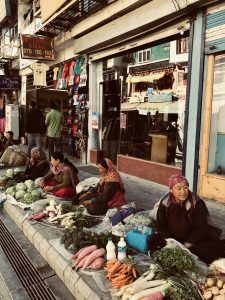 You wander along, and shop after shop after shop is full of identical Kashmiri shawls, and the men sit outside and say “Hello Madam, come look, Pashmina shawls”, and the next one takes up the chant and the next one. And on it goes, all through the bazaar. 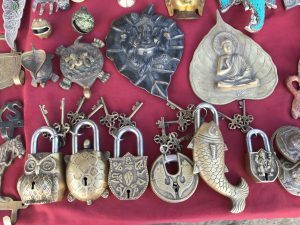 You think just one of them would have the nouse to start selling Ladakhi products. But no. “Pashmina” it is. All the way. 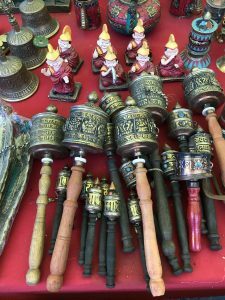 There are also, it must be said, w-a-y too many stalls selling identical “Tibetan” handicrafts. But these bother me less, because at least they fit in with the original, local vibe of Leh. I’ve decided I shall try as many of the different coffee shops as possible, favouring those with rooftop views. I wandered along Changspa Road this afternoon, and could not believe the changes. Hotels going up like there’s no tomorrow, vegan food on offer, and the inevitable signs in Hebrew – though they’ve been there for years, to be honest. The Rajasthani “mochis” (cobblers) were there, and a few Rajasthani women begging with their babies. I had an interesting chat with a mochi when I was here on a climbing trip in 2014, and needed something or other repairing. The mochi explained that it was worth the travel expense for him and his family to come from Rajasthan to Leh, such was the money to be made during the season. Tomorrow, I shall venture a little further afield than my s-l-o-w 5km potter today. I’m being super cautious with my acclimatisation this time, after ending up in hospital on oxygen the last time I was here. Before I go : one thing I’m doing on this trip (other than running a high altitude half marathon!) is to resuscitate my Instagram feed @decadeography, in which I document places then & now. I started today with the State Bank of India (as one does). A photo from 1984 and a photo from today. Do please check it out, all you fellow Instagrammers.